This tutorial shows you how we built a strong, DIY Grape Arbor from free materials. Step by step instructions and some thinking points are included. We encourage you to use this as an idea post. What do you have around your place that can be upcycled or recycled for this project? For more than sixty years; our mighty concord grapevine has ruled this old shop. regally twining its way up over the entire 80 foot length of the roof. It grows together with another concord vine, and a wisteria, on the opposite end of that 80 foot length into a complex mishmash of leafy vines basking in the sunny warmth. 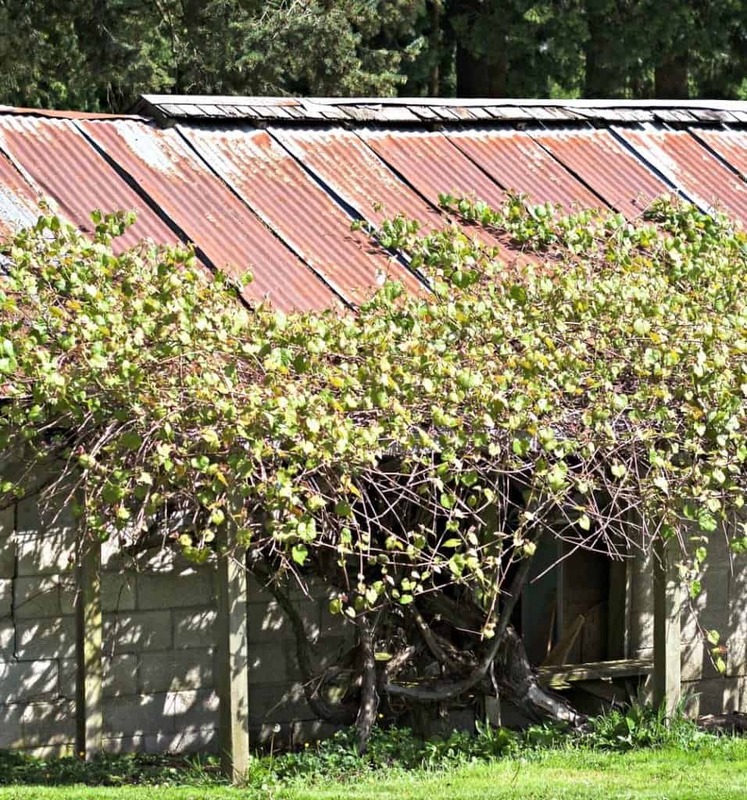 Children and adults alike, crawl onto the roof with buckets and hunt amongst those vines for grape treasure. 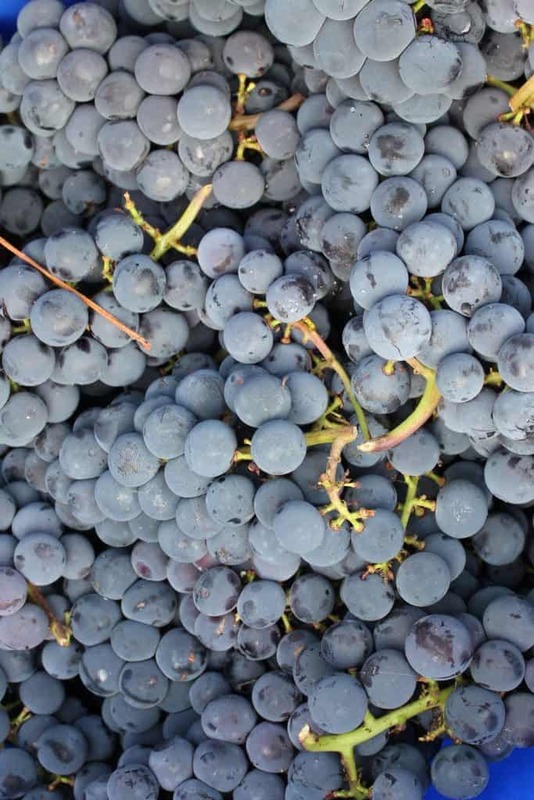 Nothing is sweeter than perfectly sun ripened concord grapes on a brisk October day! 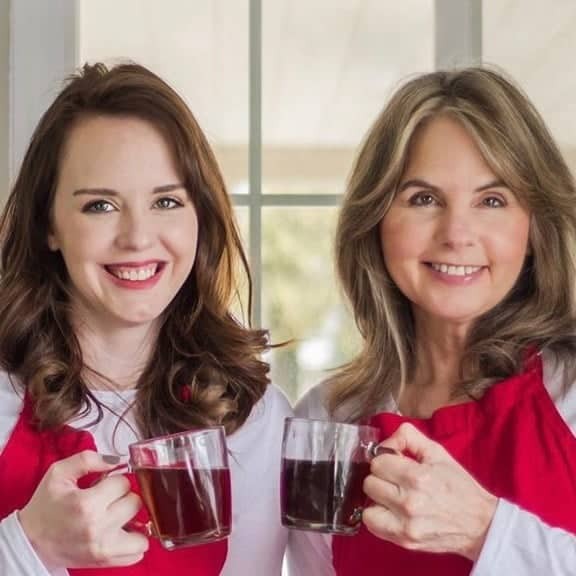 This vine has produced untold gallons of wonderful pure Homemade grape juice and wine over the years and plenty of fantastic, right off the vine, fresh Concord grapes for our family. Delicious Grapes! They make huge bunches of lovely fresh eating. Just snip them off with scissors. But they are heavy and need strong support! The uncontrolled grape sprawl goes on for several years until the old shop groans under the weight of it all and we decide it’s time to cut back the vines; repair the arbor and start the process all over. This is that year. Here is the arbor we built and instructions for how we did it! Building an arbor is best done when the vines are dormant. 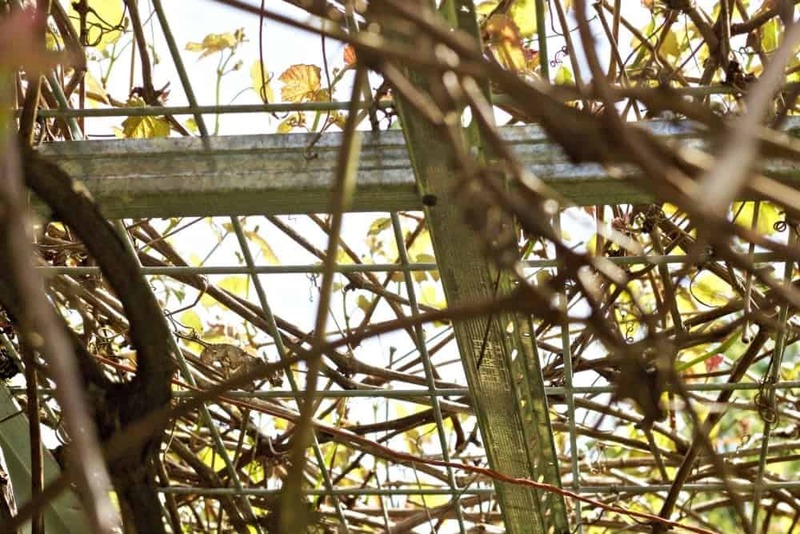 The leaves are down so it’s less work to cut the vines back and the vine can regenerate easily in the next growing season and be trained onto it’s new arbor. We had a weather break in February so we spent a week-end cutting and pulling all those vines down off the shop. What a mess! Exhausting work but it’s great to see the shop again and know the vines will be tamed for another couple of years. The old arbor top was a completely rotten, collapsed piece of cedar lath. This year we are trying something we hope will last longer. Our oldest son just made a fence using hog wire. He gave us three sections he had left over. Thank you Bill! Hog wire panels are great for all kinds of projects. We have used it for railings, Dave’s double tomato trellis in the greenhouse and Dave uses it in our garden too. Now it’s making us a sturdy arbor that is strong enough to support the ever twisting grapevines and won’t quickly rot in our damp climate. You can find these panels at feed stores, home depot, garden centers or the like. My homemade Grape juice made from Lynden Blue grapes. 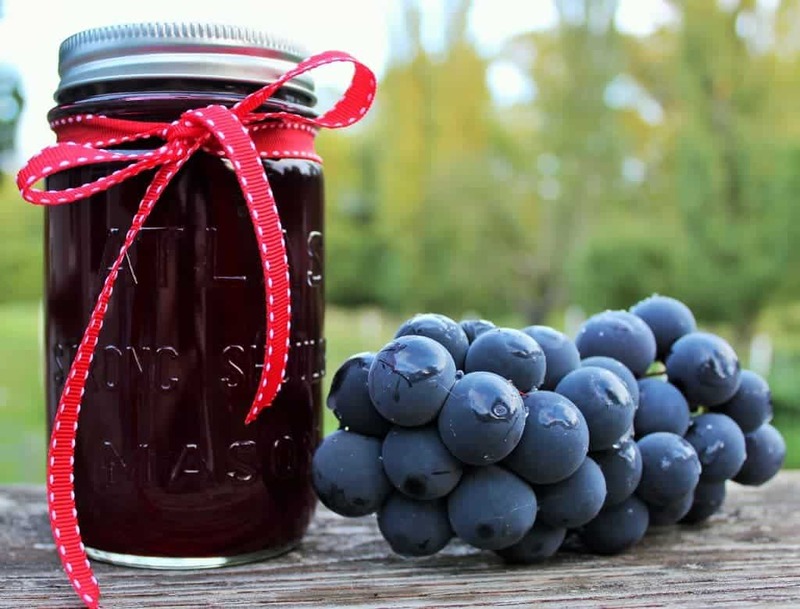 Grapes are great for juice, syrup, jelly and marinades. The possibilities are endless! Step by Step: READ this before you buy materials! Remove the old grape arbor and take stock of its layout . Decide if you need to alter the position or size of the arbor to accommodate your vine’s size and growth. 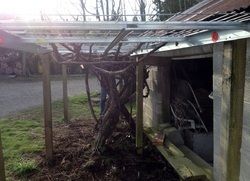 For us, the shop roof is part of the grapes arbor system. It will grow over the long, sun warmed metal roof. We make the arbor to support the heavy primary vines and give it some structure as it grows. So the old size and placement are perfect. Our arbor requires walking on a low roof to pick and trim the vines. Not ideal. It’s also next to our driveway. This is good for access, but the arbor is squeezed pretty tight. We didn’t put the vine or arbor where it is. But we are not moving it now! So we deal with it! Our Grape Arbor is MUCH too small for this grapevine by itself. 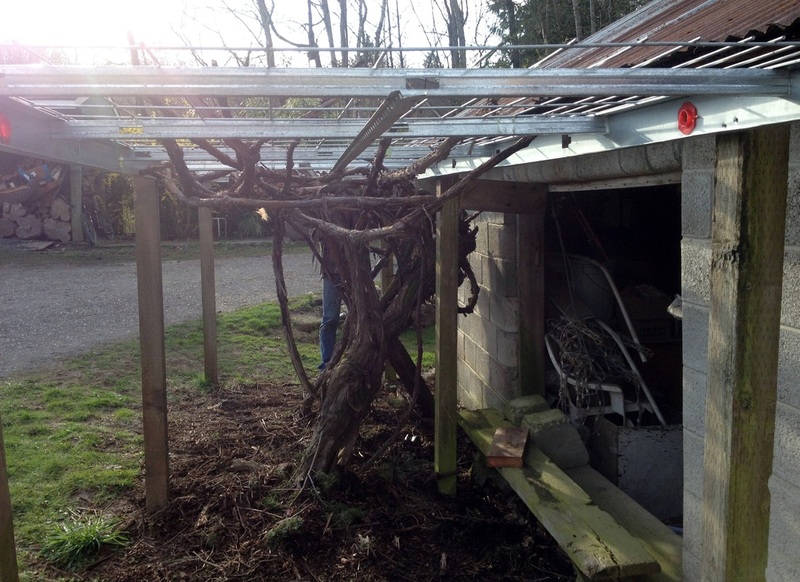 If you have no supporting structure (like our shop roof) for your vine to sprawl upon, you will need at least 25 feet of length by 5 to 8 feet wide by about 6 plus feet high, if you want to walk under and inside the arbor. That would make is easy to pick the grape clusters. They will fall under the arbor as they mature, making easy pickings. DIY Grape Arbor. Look at that massive grapevine trunk! Over 60 years old now. Grape vines need a permanent place with lots of room and strong support! This is April 2016. This is the arbor we built two years ago and are instructing about. The arbor is still wonderfully strong! Over the summer, the arbor will completely disappear under those vines! Grapes vines get HUGE! They will sprawl and intertwine for large distances (60 to 90 feet if left untrimmed). If you want a system that is low maintenance with little annual trimming, provide your grapes a warm sunny place to grow. Build A Sturdy arbor that can handle growing strong vines twisting through them. Also, for ease of picking, make the arbor high enough to walk under. Many of the grape bunches will be easy to reach if you plan the arbor correctly for your location. Pull off the old arbor top and its supporting frame. Pull any rotten posts as well. If you have to redesign or build a new arbor get enough posts to hold up the structure’s top and give it strength for the vine mass it will eventually support. Dave is using a 16 foot long hog wire panel with a steel stud frame. He placed his TREATED posts every five feet with 6 inches of arbor top overhang on each end. If you want your arbor tall enough to walk under easily, use long treated posts. We were working with free materials. So ours is a bit cramped underneath. NOTE: YOU MAY PREFER TO CEMENT THE POSTS. DAVE CHOSE HIS METHOD because the driveway gives great post support! Pull or dig out the old post after tearing out your old arbor top. Re-size the existing post hole for the new posts by using, preferably, a post hole digger, or shovel, to make the hole about two feet deep and twice the diameter of the post. Lay drain rock, or gravel, several inches deep under the post to help drain water away from the post bottom so it won’t rot out too quickly. Put the post in the hole. While holding the post up; pour(you can do this alone but a helper is nice) gravel, or drain rock, into the hole on all four sides of the post several inches deep. This supports the post and helps water drain away. Move the post around a bit in the hole to help the rock settle. Use a narrow pole(shovel ends work), to firmly tamp the rock around the post until the post is firmly supported without holding it. Fill in the remainder of the hole with dirt and tamp the dirt firmly around the post with the shovel end. Your post is done! DIY Grape Arbor metal frame and top provides support for the weight of this massive grape-vine! Dave used some free metal studs he had lying around. A friend gave them to him. These are available in drywall supply outfits. Wood works but will rot and need replacing every several years. If you plan to use wood, pressure treated 4 x 4s will hold up for years but they may leach chemicals into your grapes. Use what you have or go to the store and buy some new materials. Metal is a very practical choice for our wet climate! level the post tops to approximately level. Take a long level and lay it on the posts and cut them to level(Dave used his skill saw), yes he did this while the posts were upright, seated in their holes. The posts will not be perfectly level after you seat them in their holes unless you are incredibly lucky. Just cut them off close enough to level so you can attach the top easily. with screws with a screw gun or impact driver(Dave’s favorite), or hammer and nails to the inside of your posts, level with the tops of the posts. (Dave cut his about every two feet along the length of his long frame pieces), and screw or toe nail them into the long frame supports. Again put them in between your long pieces and keep them level with the top of the posts. As you can see here the frame is simply constructed. Two long frame pieces and several short frame pieces connecting the frame and supporting the top. You can make the arbor out of expensive materials and make it lovely. Make a patio under it with benches for a lovely breakfast or gazebo spot as my brother did with his!… or go utilitarian and practical as we did. DIY Grape Arbor finished! The leader vines are trained and the top of the arbor is now wired to its frame! Grow On Grapes!! Our system works well for a leafy vine like this enormous grape that will completely conceal the arbor most of the year. It’s not really beautiful unless you appreciate the free cost, long life and excellent material quality for this job! To us it’s perfect! DIY Grape Arbor metal frame and top provide the support the grape needs and it won’t rot! The hog wire is incredibly easy to install as a top for the arbor. Just lay it on your finished top frame and pull the vine leaders through from underneath. It’s better to do the vine maneuvers before wiring it to your framing! Quite a bit of pushing, pulling and some final vine cutting may be necessary before the vine leaders and top are well settled in place. NOW wire,(as we did) or nail or screw the top to your frame! All done. The arbor is ready for the new growth. Soon it will disappear under the new leafy vines; providing the support our dear old grapevine needs to produce juicy, sun kissed, concord grapes. An important job! Building and Arbor is a great spring project while your vine is dormant. Finished! you can see the frame structure Dave built to support the hog wire.Our DIY grape Arbor will last for many, many years to come! Lest you feel sorry for the grapevine being cut back so severely; look to the bottom picture for reassurance. In one growing season the grapevine is, as usual overrunning the arbor and making it’s way up onto the old shop roof once again. We won’t be cutting it back again so severely for several more years. Grapevine is happy! Over the years it will completely cover the shop top. Then we will cut it back again! FYI: If you are now deciding NOT to make your own arbor here’s an idea. My brother has a purchased square metal gazebo for his grape arbor in his yard. It’s VERY attractive and has all the elements needed to make a useful grape arbor. And it’s fun to sit under 🙂 Just sayin.